As a frequent globetrotter, I like to practice my yoga in many different places. Ideally, I’d like to take my mat from home, but I have so many other items jostling for space in my bag. The best yoga mat for travel is something I can easily fold up and take down to the beach or to the top of a mountain for an unbelievable yoga experience. Yoga is an incredibly fulfilling pastime that you can do just about anywhere. I love my regular yoga mat with the thick cushioning and protection it offers my joints, but it’s by no means the best yoga mat for travel. It’s bulky, heavy and even when rolled up not too easy to carry. Sometimes traveling with a rolled up mat on your back is not only awkward but also attracts many glances from bemused strangers. If you’re looking to take your yoga on the road, we’ve got you covered and have looked at many of the top-selling travel yoga mats that’ll make that namaste on a desert island a reality. Wide choice of 16 colors. Made from biodegradable non-Amazon harvested natural tree rubberand is 99 percent latex free. Textured surface provides grip even when wet. Built-in straps for hanging and carrying. Unique folding design folds down to size of a newspaper or large water bottle. Made from sustainable natural rubber with cotton mesh for durability. Soft fabric surface becomes more grippy as it gets wet. Ideal for Bikram and hot yoga. Weighs less than 2 pounds, just 1 millimeter thick and folds down compact. Available in 68 inches or 74 inches for taller yogis. ⅛ inch thick and rolls up to be taken almost anywhere. Scored 2-millimeter thick yoga mat. Folds down to 10 inches x 12 inches compact square. As we look for ever more fulfilling yoga experiences, many of us are picking up our mats and taking them to far flung destinations. It may just be a weekend away visiting friends or relatives, but in some cases it can involve journeying to the other side of the world. Many yogis feeling the call to the motherland of yoga, India, where yoga dates back to 5000 BC and yoga is still viewed as a lifestyle. Yoga can be a great way of stretching those muscles after hours cramped into an airline or coach seat, or simply an invigorating start to the day. The following video shows a great yoga workout to start your day when traveling that needs little more than a mat. 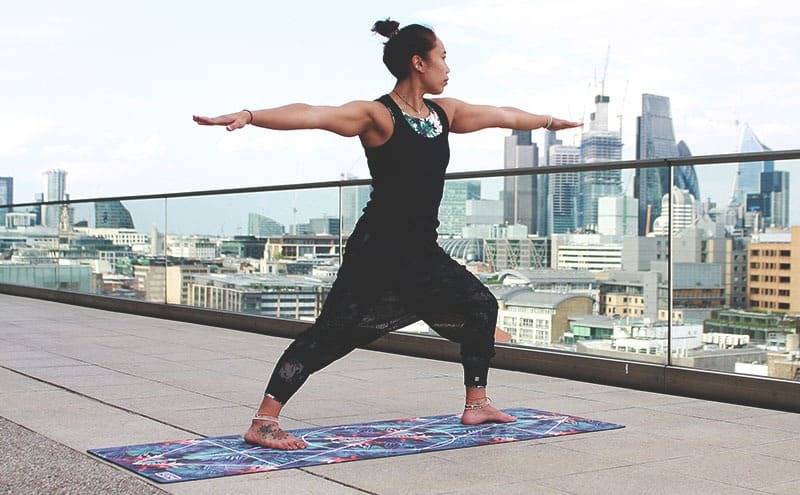 After looking at many of the travel mats for yoga on the market, we’ve managed to narrow it down to the following five mats, any one of which could be your best yoga mat for travel. 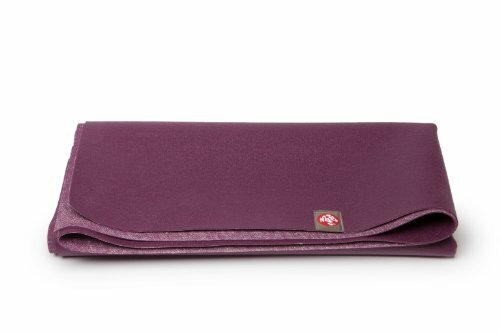 Manduka is well known for its quality eco-friendly yoga mats and this is its lightest mat ideal for traveling. At only 1.5 millimeters thick and weighing less than 2 pounds this mat is easy to fold and go. The closed-cell surface prevents sweat, dirt and bacteria from absorbing into the mat’s surface (you don’t really want to be carrying those around too). An orange peel-like texture offers solid grip, even with light perspiration. Despite being lightweight and thin, the tightly woven scrim resists tearing or scratching on any surface. Available in 16 bright colors, this mat is produced in a zero waste manufacturing process, so it’s not just good for your mind, body and soul but the planet too. Closed-cell design to prevent growth of bacteria. Stickier than many similar mats. Very thin and doesn’t offer much cushioning. May hurt the wrists.. Not machine washable.. Can be too sticky with mat bunching up in some transitions. This is one of my favorite mats for traveling with and has accompanied me on many long-haul adventures. A specially patented folding and securing system makes it so easy to stash in any smaller bag. The origami-like fold ensures the top surface never comes into contact with the base keeping grime off your work surface, while the straps can also be used to hang it in the shower cubicle for drying or brushing off any debris. A cotton mesh stops the mat from stretching with regular use with a sticky high-performance rubber ensuring it doesn’t slip. Kudos to YOGO which plants a tree in Central America for every mat sold and gives training in organic farming to local communities to provide them with a sustainable alternative to deforestation. Fits into the smallest of bags. Very sticky on top and bottom. Mesh cotton stops mat from stretching. Too thin for some customers. May need to be doubled up with another mat on hard floors. Can be difficult to get used to folding especially for people with arthritis or other mobility issues. For those of you who like to get sweaty when you practice yoga, this mat has a super soft fabric surface designed to keep up with your sweat. The soft surface grips your hands and feet without being too sticky and offers more grip as it gets wetter. Perfect for hot yoga it’s odor free and easy to clean with a special waterproof layer forming a hygienic barrier to prevent odors and keep bacteria at bay. When it needs freshening up it’s fully machine washable. With this mat you can be sure you’re not placing your health or the environment at risk, its made from non-toxic materials and is latex free, with eco-friendly natural rubber that won’t peel, fade or flake like plastic mats. At 71 inches long it’s large enough for even taller yogis and easily folds into a tiny square for travel. Available in three colors, white gray or my favorite, dusty rose. Unique top layer absorbs sweatand grip gets stronger as it gets wet. Best travel mat for fans of hot yoga. Very thinso best used on carpet as not much cushioning. 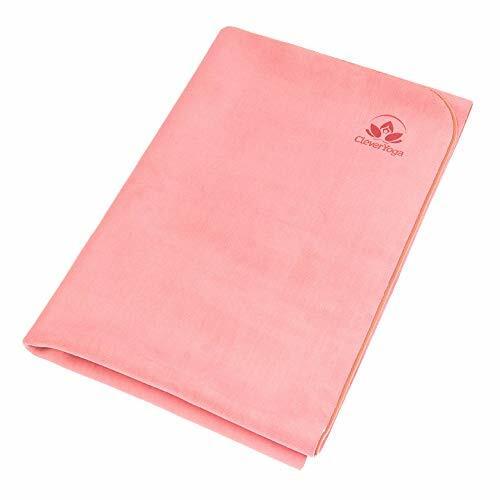 Closer to a yoga towel with rubber backing. Some customers complain of slipping despite Clever Yoga's claims of stickiness. The open-cell, natural rubber used in this mat gives extra non-slip grip ideal for holding those poses for longer. Natural rubber also provides extra resilience and cushioning, although at only ⅛ inch thick this is a thin mat designed for travel. Jade even promises to plant a tree for each mat sold in conjunction with Trees for the Future ensuring this is a renewable and eco-friendly substance. At 3.2 pounds this is one of the heavier travel mats we looked at, and it can’t be folded although it rolls into a thin tube that’s easy to toss over your shoulder or stow away in your suitcase. The extra length mat is perfect if you’re a taller person who needs more room to practice. Available in choice of black, midnight blue, olive green or purple. One of thicker travel mats available. Easily washed with cold water and soap. Breaks down with time or loses small pieces with multiple use. Rubber can feel heavier at 3.2 pounds. Quite pricey for non-folding mat. 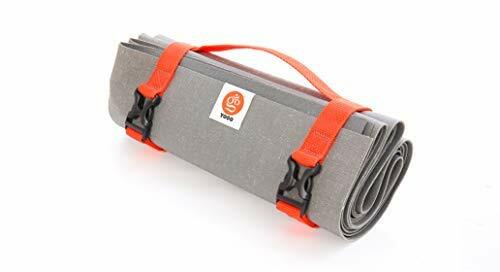 This scored yoga mat is a respectable 68 inches long and 2 millimeters thick but folded up only measures 10 inches by 12 inches to fit easily into most carry-on bags or tote bags. Ideal for that weekend getaway or extended retreats. The unique sticky texture will keep you from slipping or sliding when you’re doing your downward dog. 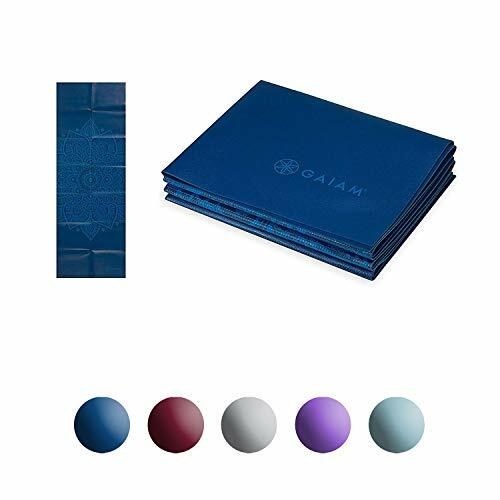 One of the cheaper mats we’ve looked at, it’s made from rubber that gives off no odor, and comes in a choice of six attractive colors. The creases and folds make it super easy to clean and ensure the used side of the mat never touches the unused bottom. It’s designed to be lightweight, only half a pound, but lacks cushioning like many travel mats and is better suited to carpets or softer floors. Inexpensive from reputable brand name. Easily folds into compact square. Sticky surface makes it ideal for people with stability issues. Customers have praised the complete lack of odor that sometimes accompanies rubber products. Not suitable for hot or Bikram yoga. May not provide enough cushioning for people with sensitive joints. Can get very slippy on surface. Obviously we would be much more comfortable if we could take our regular yoga mat on our travels with us, but often luggage space is at a premium. The best yoga mat for travel should be a lightweight alternative that can still provide us with that non-slip surface we need, be durable enough to withstand regular use and climate changes yet be compact and light enough to squeeze into our suitcase or carry on bag. And as a modern yogi, we should try to find a product that’s not just body friendly but eco friendly too. The lightweight and portable folding design of the Manduka eKO SuperLite Travel Yoga and Pilates Mat, along with its environmental credentials make it, in our opinion, the best yoga mat for travel. A durable yet compact mat at a reasonable price point, Manduka has created a mat that you can happily travel the world with and perform your yoga almost anywhere, even on that idyllic each in paradise.